Out with the Old…In with the New, or something like that! After being missing in action in the studio through the holidays, I got myself back in the studio the past few days. Ahhh, it is a wonderful feeling to be there. I have been starting a couple of new oil paintings that will finish up in the new year 2014. OMG, 2014. I just know a lot of good things will come with this new year. I know you get tired of hearing about all the layering, editing, mark-making, and then covering up and scraping back. But what can I say… that is what I do as I try to find my bliss. I didn’t say it was easy but it is such an unexplainable feeling when something finally comes together and you know this is what it is all about. HOWEVER, I am not there yet with these two 30 x 30 oil paintings. Oil is a lot slower process for me……harder to get the paint down, messier, longer drying between all the layers….but such a wonderful, velvety richness when you do get through it all. Here is what I have after a couple of days of layering, editing ,etc…. I will pick back up on these in the New Year. Thank you for tuning in while I talk to myself about my work and what is going on in my life that affects my work. Happy New Year…..2014 is going to be wonderful. 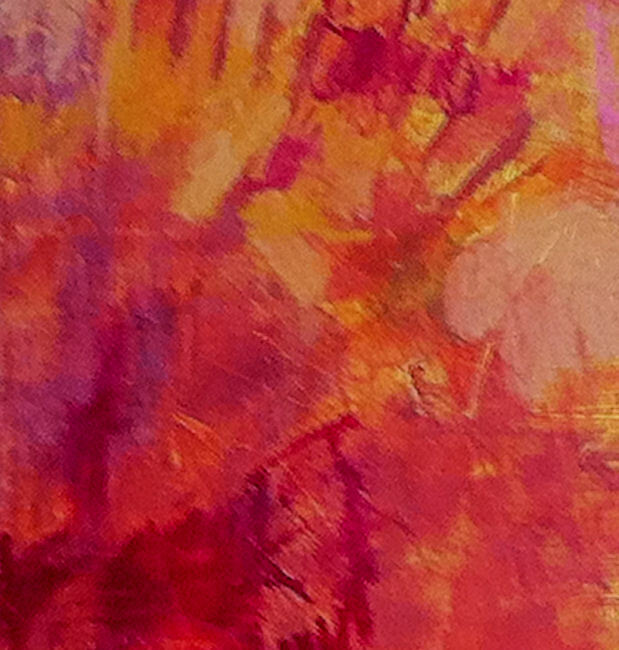 Payback for days when your paintings paint themselves…..days when you are frustrated. This happens now and then, especially when I am mixing it up in the studio between mediums. 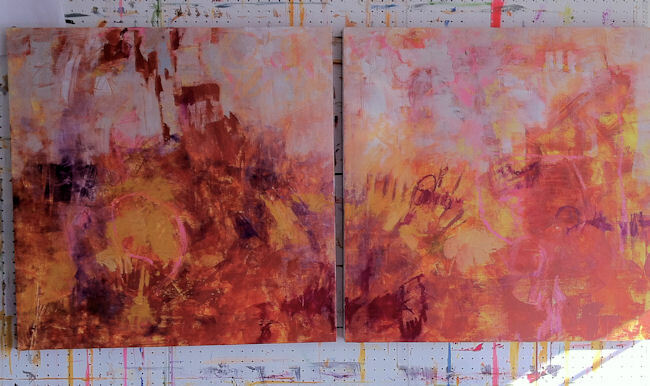 I’ve been heating up the encaustic wax but also finishing up and varnishing some acrylic paintings.In fact, I still have one large acrylic painting that I just keep looking at like it might finish up on it’s own…. yeah, I know…but all of a sudden I will just go for it and paint it all out or something will occur to me that I want to try on it. But, back to the encaustic. I scraped off the wax from two previous paintings that were never finished since now the inspiration for finishing them is gone. When I haven’t been working with a medium for a time, I feel awkward with working with it for a time. That is the way my day has gone with this work. AND on top of that this is an extreme rectangle that is never my best format. I had no real thought in mind but I have been mulling over the thoughts of all my paintings actually having a long story in layers beneath the surface. 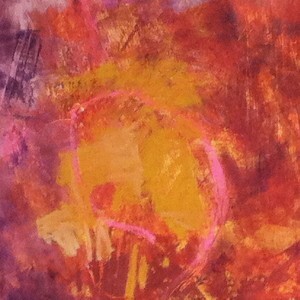 Especially with encaustic, you build layers even more than you do with other mediums. The painting experience can be quick or slow and contemplative. One thing that happens to me is that it is usually contemplative since time is taken to heat up the wax and get sufficient paint out and heated, etc. Once I get a lot of paint down on the panel, then I can start thinking, feeling, and seeing what my imagination or memory directs. Then it doesn’t matter how many layers are added or subtracted, the painting tells me where to go. Most times, my paintings go toward natural forms but not in the way they really look when you see them but the way I feel the place or environment. I like this since we all have different ways of feeling toward our surroundings and our response will be different. This painting is like many………..I just felt my way along. I don’t know that it is finished as I will need to come re-visit it in the studio, look and decide then whether or not to keep adding more layers.